We’ve asked Karen Schoenewaldt, Registrar at The Center for Art in Wood, to share with us the exciting work going between the Center and Bartram’s Gardens following a storm that took down many trees at the Gardens. The resulting art exhibition will be touring for the next two years and the Center is soliciting ideas for venues to host the exhibition. A violent rain and wind storm was the catalyst that brought two Philadelphia organizations together — Bartram’s Gardens, the home of famed 18th-century explorer and botanist John Bartram, and The Center for Art in Wood, a museum and research library with a rapidly growing collection of wood art. When the storm devastated the grounds at Bartram’s in June 2010, local wood turner and past Center board member Brad Whitman wondered if this loss could form the basis of an art project. Within six months the Center put out a call for artists to propose and create works that incorporate thirteen types of trees felled by the high winds. The initiative afforded artists a unique opportunity to “remix” the history, inspirations, and materials from one of America’s oldest gardens into sculptural objects and installations. Bartram’s Boxes Remix challenges artists to free themselves and make unexpected work that they had not yet time to create. The title was inspired by the boxes John Bartram designed and shipped to colleagues in England starting in 1735, which contained seeds, plants, and curiosities that he had gathered in his travels through the eastern American colonies. His practice and the designed gardens he created on the outskirts of Philadelphia became an international hub of plant knowledge and diffusion, preserved now as a historic site. The Center’s call for entries attracted over 100 responses from artists around the world. Fifty-eight artists attended two retreats the Center sponsored at the Garden. On these visits, the artists explored the site for inspiration, were briefed on the Bartram archives, and examined the refuse wood available to be recycled into art. 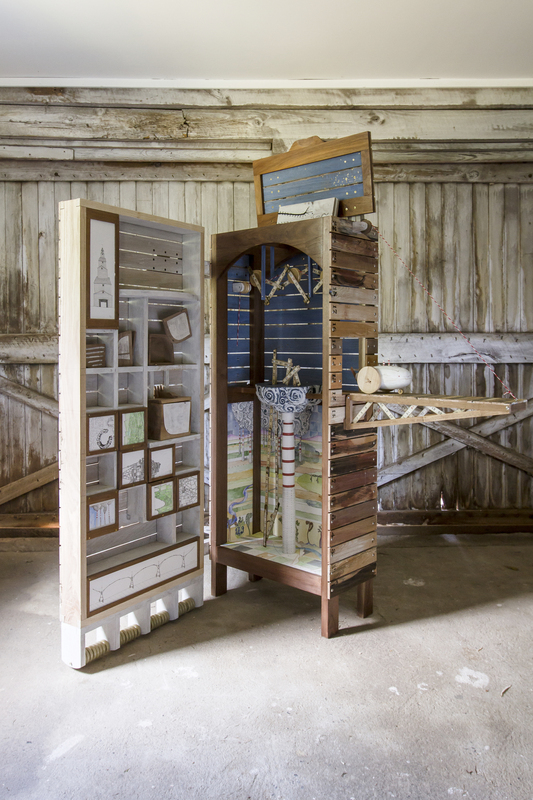 This unique exhibition brings together 36 projects by 39 artists and will run May 2 through July 19, 2014, at The Center for Art in Wood and Bartram’s Gardens and then travel for two years. Each artist’s proposals and finished work can be seen online at Center’s website under “Traveling Exhibitions.” A lavishly illustrated catalog will accompany the show. The organizers are currently planning the tour schedule and welcome ideas for venues that could host the exhibition for any period through 2016. Details about the tour are available on the “Traveling Exhibitions” page. For more information about the Center and Bartram’s Garden please visit the Center’s website or that of Bartram Garden’s. Some examples of the art produced are below. The works are as diverse as the materials they worked with. Some artists chose to collaborate, as is seen in the following two pieces (four photos).